A commercial sewer line is the main artery between a building and the Collinsville, IL civic sewer system: transporting waste from sinks and toilets away from the property and towards proper treatment. Sewer lines are vitally important to any building, but commercial properties more than ever. You need your staff to work in a healthy environment, as well as presenting your customers with a clean and pleasant place that they associate with good things. So when problems arise with your sewer line, you need them treated quickly and professionally. That’s where we come in. At Embrich Plumbing Co, our trained plumbers handle commercial sewer line services with great frequency, and we have the skills to take on any problem that might come up. If you need a new sewer line installed, then we’re the number to call first. If you’re having trouble with your existing sewer line, we offer emergency service to take care of it fast. Either way, we’re standing by to help. Contact us today and let us get started making things right! Trust Embrich Plumbing Co for commercial sewer line services. Installation or replacement of a new sewer line can be a daunting prospect in the best of circumstances. It’s located underground, which makes reaching it very difficult, and in the throes of our Collinsville, IL winters, it can be almost impossible. This is doubly true for sewer lines on commercial properties, which not only have to deal with increased volumes of wastewater, but must also account for commercial health codes and similar issues that come from being in business. Embrich Plumbing Co uses advanced techniques to install new sewer lines that cut down on time and cost without skimping a bit on quality. Contact us today to see the difference between "good enough" and "great." The good news about the installation of a new commercial sewer line is that you don’t have to do it that often. Unfortunately, commercial sewer lines tend to need maintenance and repair more often than residential lines do, owing to the increased volume of use. Trouble can arise in the form of lodged particles—a particular concern with restaurants and food preparation businesses—as well as breaches caused by freezing, tree roots and other factors. Embrich Plumbing Co can handle repairs with the same efficiency, first by diagnosing the problem with complete accuracy, and then repairing it with speed and reliability. Embrich Plumbing Co understands that commercial sewer problems can’t wait, and that installation, repairs and maintenance needs to take place without disrupting your business at all, if possible. That’s why we pride ourselves on speedy service and offer emergency calls after business hours for those times when the issue just can’t wait. 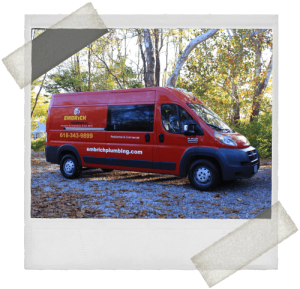 If you spot puddles where none should be, if you detect strange odors coming from your pipes, or if water pressure or drain flow in your building experiences any kinds of problems whatsoever, pick up the phone and call us! We’ll get to the bottom of the problem quickly and restore service with maximum efficiency: getting your business back up to speed and letting you get back to it as fast as possible.